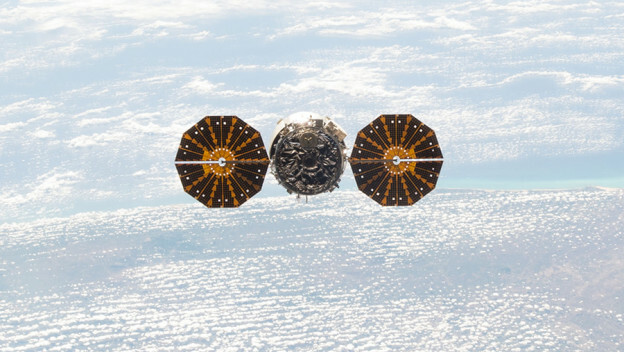 The Cygnus spacecraft is seen departing the station after its release from the Canadarm2 Tuesday morning. A pair of Expedition 47 crew members tested the motion control system of the docked Soyuz TMA-19M spacecraft. Soyuz Commander Yuri Malenchenko and astronauts Tim Kopra and Tim Peake will ride the Soyuz back to Earth early Saturday morning. They will undock from the Rassvet module then land in Kazakhstan ending a 186-day mission in space. The trio continued packing the Soyuz and training for Saturday morning’s descent. The crew will experience strong jolts, heaviness and labored breathing and speech as they re-enter Earth’s atmosphere and begin experiencing gravity. After Cygnus departed safely away from the International Space Station on Tuesday scientists from NASA’s Glenn Research Center sparked a large fire inside the space freighter. The Saffire-1 experiment is exploring how fire behaves in microgravity so engineers can design safer spacecraft. NASA astronaut Jeff Williams worked on two U.S. spacesuits ahead of a pair of spacewalks targeted for later this summer. He sampled the cooling loop water then scrubbed the cooling loops inside the spacesuits. Flight Engineer Oleg Skripochka continued transferring cargo in the Progress 63 resupply ship. His fellow cosmonaut Alexey Ovchinin worked on the Plasma Kristall experiment exploring how micro-particles become highly charged and interact in plasmas.